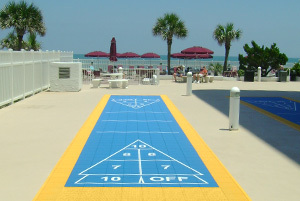 While it may be possible to play shuffleboard on any flat surface, court tile has become the preferred surfacing choice for most shuffleboard aficionados. When compared to painting a concrete slab, the benefits are obvious. 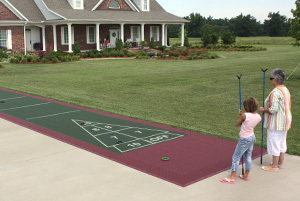 Plastic court tile minimizes friction for ultra-smooth glide. Simply apply a light spray of silicone to the bottom of the shuffleboard disc prior to play and let the games begin. Interlocking tabs and cross-grid tile design create an even playing surface for ideal performance. Open cross-grid design drains water within minutes, allowing players to get back out on the court quickly, even after a heavy rain. Duraplay court tiles are comprised of 100% recyclable materials and are up to 50% cooler than asphalt or concrete. Virtually maintenance-free, unlike traditional clay and hard court surfaces that require regular care. Created from polypropylene, Duraplay shuffleboard court tiles are designed to be more durable and less susceptible to fractures compared to similar tiles made from PVC. Color Fast UV protection keeps shuffleboard court tiles brighter for longer. Backed by a 10-year warranty with a 25-30 year life expectancy. Can be assembled and used on any flat surface area. Disassembles into easy-to-store 4' sections in 30-45 minutes.